The vast and diverse continent of Africa has a reputation for delivering a range of Safari experiences. The African Travel Specialists are passionate about offering new and unique experiences to our clients. It is with much excitement that we bring to you our accommodation spotlight in Kenya. Owned and operated by local Kenyan award winning guides Paul Kirui and Johnson Ping’ua (known as Ping), Enaidura Mobile Camp is perfectly positioned in the Masai Mara ecosystem to experience the Great Migration as it moves into the region from July through to October. Regardless of the time of year, this camp offers extraordinary wildlife. October saw African Travel Specialist, George experience 3 weeks on safari in Kenya. There were many highlights, but having spotted 11 lions and 2 cheetahs just transferring from the airstrip to the camp, the game rich and newly opened Enaidura Luxury Mobile Camp was a stand out. Enaidura is known as a classic camp that keeps you connected to the bush at all times. Personal service and fantastic meals are a welcome part of the camp experience and on par with high-end permanent luxury safari camps. Critical to the safari experience is the flexibility to pack meals to go, as well as tailor in camp meal times completely around your game viewing. Game drives are the focus at Enaidura. Especially designed, open-sided vehicles deliver an intimate wildlife experience. Each party has a private guide and vehicle so the schedule and game viewing priorities are your call. This months accommodation spotlight in Kenya, Enaidura Camp is available as an exclusive private camp for just your party or on a share basis. Parties staying on a share camp basis still receive their own private guide and vehicle. Named one of Conde Nast’s Best 25 Safari Guides for all of Africa, Ping possesses an uncanny ability to predict animal behaviour, making him legendary for predicting the perfect position during action events. Being a Maasai, Ping also brings the opportunity of cultural learning to his groups. As a boy, Ping was always interested in the wildlife and environment around him. His early days in guiding included time at CC Africa. Some of his time was spent in South Africa participating in an outstanding training program under the tutelage of Kenyan legend Paul Kirui. 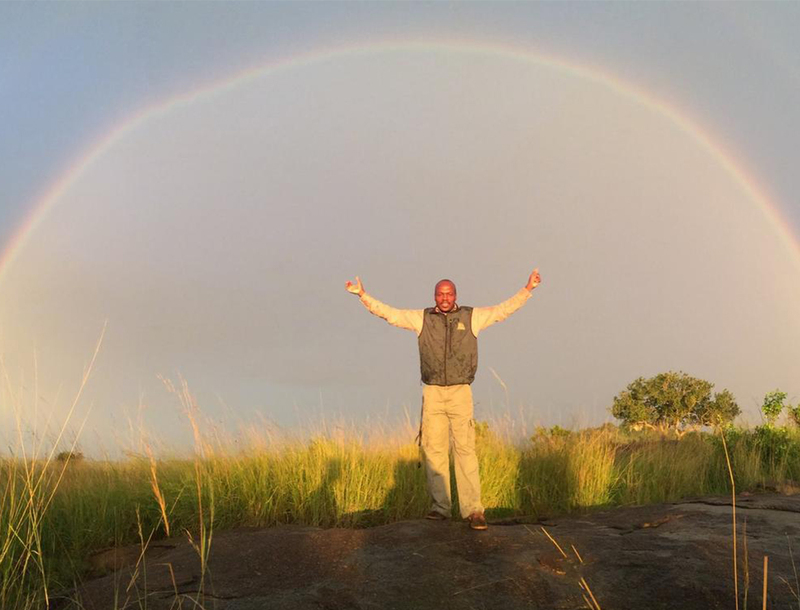 Paul was the second guide in Kenya to achieve Gold Level Status. Chairman of the Kenya Professional Safari Guides Association, Paul also gained recognition as one of Conde Nast’s 15 Safari guide Legends. More recently Paul earned the Ecotourism Guide of the Year Award in 2016. Paul is well known from his outstanding work guiding film crews for their productions. Since 2006, Paul has worked with the BBC Natural History unit as a consultant for the leopard filming crew during the Big Cat Week and Big Cat Live programs. He also guided film crews for the BBC’s documentary, The Truth About Lions, in 2009 as well as Disney Nature during the filming of African Cats. Nothing says authentic safari experience quite like staying under canvas. The camp is light on the earth and can migrate between the best locations for the time of year. Although the camp has a minimal footprint, the quality is not compromised with fantastic service, attention to detail and brilliant cuisine consistently delivered. There are six guest tents in the camp. A private party can have access to up to eight tents. Guest tents have double or twin beds. Each tent has an en-suite bathroom which includes flush toilets and safari bucket showers as well as laundry. Staff deliver Hot water when required. Keeping the footprint light, this camp has solar power for lighting and charging your batteries. This months accommodation spotlight in Kenya is perfect for the Safari goer who is looking for an authentic experience. Prolific with wildlife, the opportunities are plenty to see Masai Mara at its best. Take advantage of this exclusive location. See the Great Migration guided by true legends of the safari world. We’re in love and we’re sure you will be too! The Enaidura Mobile Camp experience is second to none.